How to decide on an advertising tool? If you haven’t noticed already, the advertising landscape is quite complicated. Take a look at the marketing landscape here and try to make sense of it. I guarantee you’ll be there for a while. 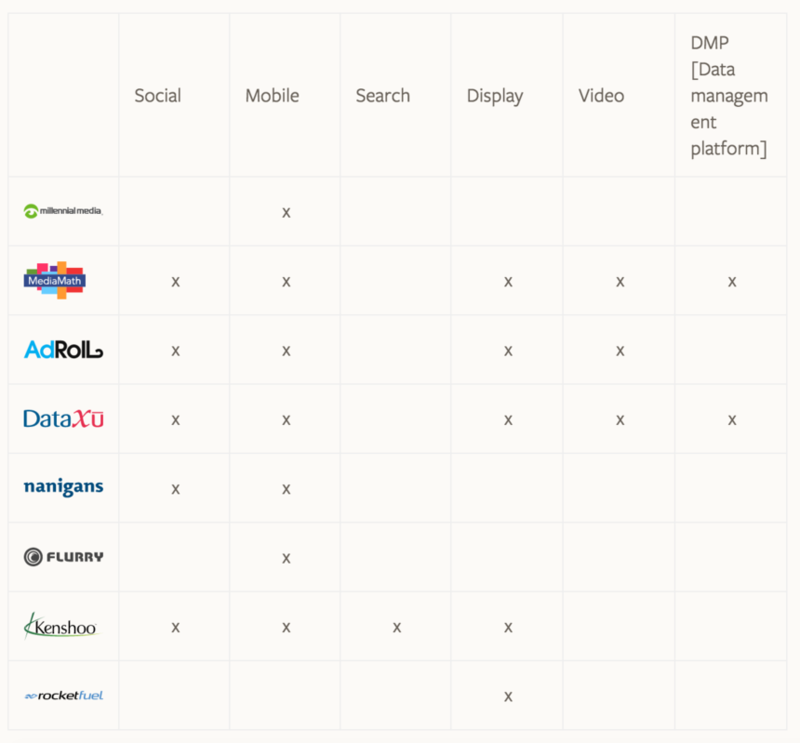 Ad Buyers and Retargeting platforms: These platforms help advertisers programmatically buy inventory from the ad suppliers by optimizing budgets to reach a specified goal (Cost per acquisition, Cost per click, Cost per thousand impressions, etc). Attribution and Audience Management: Given that many of the ad buying platforms are focused on a specific channel (social, mobile, display, etc) and companies may use multiple ad buying platforms or work directly with suppliers, attribution tools exist to provide a complete view of how these different platforms are working together to drive value and conversions for your business. The audience tools will also help you understand who your core customer is so you can direct future ad dollars to those customers more likely to convert. Let’s start with what we’ll call “the giants” a.k.a Facebook, Google, Twitter and some others. These large media supplier generate a huge amount of media inventory that they directly control. They also make money by selling ads at very large scale, and because of their scale, many advertisers will work directly with these platforms to buy media and optimize campaign budgets around goals and target audiences. For example, an advertiser can work directly with Google to manage campaigns across video (YouTube), paid search (Google Adwords), display (Google Adx) and social (Google+). The drawback of working directly with one of “the giants” is that advertisers are limited to the media inventory available on these platforms. Additionally, advertisers lose out on a significant amount of inventory available from smaller publishers not available via “the giants.” Instead these smaller publishers place their inventory on open exchanges (full disclosure, Google runs Adx - one of the largest exchanges) where advertisers can bid on impression opportunities using an ad buying or retargeting platform. Those same ad buying platforms can access inventory from “the giants” making for a more holistic approach to buying media. Now that we understand where most of the media inventory comes from, let’s dive into how advertisers can buy this media. Most of the media types usually require a direct relationship with publishers. For now, we’ll focus on the core media channels which include mobile, social, video, search and display. Targeting preferences: Retargeting pixels, user segments, media channel/type, geo, demo/psychographic, publisher site, interests, etc. Creative: What does the ad look like! With the above information, most ad buying platforms have enough information to launch a campaign. With targeting preferences, the buying platforms know which individuals they’re trying to reach. With campaign goals, the buying platforms know how much to spend on impression opportunities. The platforms will then dynamically bid on impression opportunities looking to maximize the amount of goal conversions. As the campaigns generate more information about what’s working and what’s not, basically an algorithm, they can begin buying media and optimize advertising budgets to buy media from different media suppliers. Now that you’ve set up advertising campaigns, the next challenge is to make sense of how your campaigns are performing across channels. For example, if you have campaigns running on Facebook for social, Adroll for mobile and display, and Kenshoo for search, you’d easily be able to see which channel drove the most conversions at the lowest cost. However, an issue arises when a user who converts saw ads from more than one channel, say a Facebook ad and a PPC search ad. Having the knowledge that you can have the same user across channels, is great as they let you know which channel drove an action or drove the behavior of a specific consumer. You not only need an attribution model to tell you where to spend your money, but also the story of where people come from, what brings them back and what makes them buy. Convertro and Adometry have models that learn what role each channel is playing between you and your customers, and uses that information to invest more wisely. Comscore and Quantcast track all internet data on its surveyed computers in order to study online behavior. Through this, they make educated guesses about the user based on their internal measures and then displaying that person the ad.